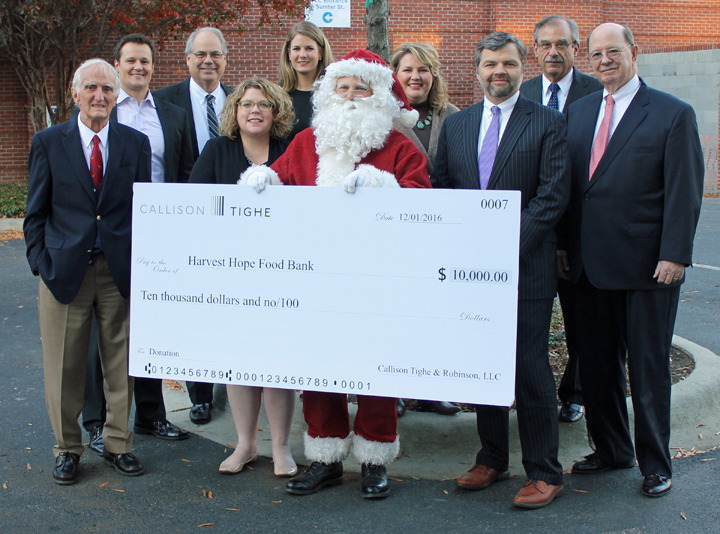 COLUMBIA, SOUTH CAROLINA – Callison Tighe & Robinson has donated $10,000 to Harvest Hope Food Bank, continuing its long-standing support of the non-profit organization that helps feed 2 million people in South Carolina each year. Callison Tighe made its first contribution to Harvest Hope in 2009 as the state and the nation fought to recover from a recession. The donation became an annual tradition, and over the years Callison Tighe has contributed $85,000 to the food bank. Though most of the donations have been during the holiday season, Callison Tighe also has heeded the call during severe summer shortages and in the aftermath of last fall’s devastating hurricane. The firm has assisted Harvest Hope in other ways as well, donating a pickup truck that the organization uses to transport donations and also packing boxes of nonperishable food for distribution. Founded in 1981 in Columbia, Harvest Hope has grown to partner with 476 non-profit agencies to serve people across 20 counties. The food bank feeds about 38,000 people a week and distributes around 28 million pounds of food annually. Harvest Hope also is South Carolina’s primary emergency hunger relief organization, mobilizing quickly if a manmade or natural disaster strikes. Harvest Hope’s need is crucial during the holidays. The organization is seeking donations of non-perishable food and supplies and also is asking businesses, churches and schools to sponsor food drives. To learn more, visit harvesthope.org or call (803) 254-4432.